Electrochemical technologies are emerging as important approaches for effective and efficient pollution remediation, both on their own and in concert with other remediation techniques. Electrochemical Remediation Technologies for Polluted Soils, Sediments and Groundwater provides a systematic and clear explanation of fundamentals, field applications, as well as opportunities and challenges in developing and implementing electrochemical remediation technologies. Written by leading authorities in their various areas, the text summarizes the latest research and offers case studies that illustrate equipment, installation, and methods employed in real-world remediations. 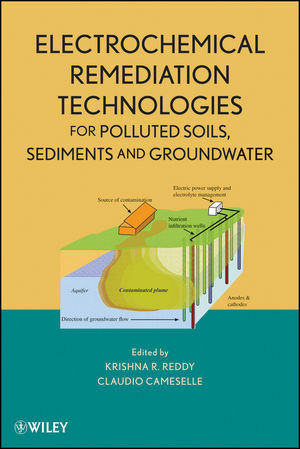 Unique as a comprehensive reference on the subject, Electrochemical Remediation Technologies for Polluted Soils, Sediments and Groundwater will serve as a valuable resource to all environmental engineers, scientists, regulators, and policymakers. Krishna R. Reddy is Professor of Civil and Environmental Engineering at the University of Illinois at Chicago (UIC). Dr. Reddy received his PhD in Civil Engineering from the Illinois Institute of Technology, Chicago. He received gold medals for being first in his class of BS (Civil Engineering) at Osmania University and MS (Civil Engineering) at the Indian Institute of Technology, Roorkee. His teaching and research expertise includes remediation of contaminated sites, waste containment systems, and beneficial reuse of waste/recycled materials. His research contributed to the understanding of fundamental geochemical processes and development of integrated electrochemical technologies to remediate contaminant mixtures. He is the coauthor of Geoenvironmental Engineering: Site Remediation, Waste Containment, and Emerging Waste Management Technologies, also published by Wiley. Claudio Cameselle is Associate Professor in the Department of Chemical Engineering at the University of Vigo, Spain. He received his undergraduate degree and his PhD in chemistry at the University of Santiago de Compostela, Spain. He then moved to the University of Vigo, where he has been working as a faculty member for the last fourteen years. He spent a sabbatical year as visiting professor at the University of Illinois at Chicago in 2008. His teaching activities are in the areas of chemical engineering and environmental engineering. In recent years, his research activity has focused on the development of electrokinetic remediation for the treatment of soils and sludges polluted with heavy metals and organics. PART I Introduction and Basic Principles. 1 Overview of Electrochemical Remediation Technologies (Krishna R. Reddy and Claudio Cameselle). 1.2. Electrochemical Technologies for Site Remediation. 1.3. Electrochemical Transport, Transfer, and Transformation Processes. 1.4. Electrochemical Removal of Inorganic Pollutants. 1.5. Electrochemical Removal of Organic Pollutants. 1.6. Electrochemical Removal of Contaminant Mixtures. 1.7. Special Considerations in Remediating Polluted Sediments. 1.8. Electrokinetic Barriers for Pollution Containment. 1.9. Coupled (or Integrated) Electrochemical Remediation Technologies. 1.10. Mathematical Modeling of Electrochemical Remediation. 1.11. Economic and Regulatory Considerations. 1.12. Field Applications and Lessons Learned. 2 Electrochemical Transport and Transformations (Sibel Pamukcu). 2.3. Electrochemical Transport in Bulk Fluid. 2.4. Electrochemical Transport in Clays in the Direction of Applied Electric Field. 3 Geochemical Processes Affecting Electrochemical Remediation (Albert T. Yeung). 3.2. Soil–Fluid–Chemical System as Active Electrochemical System. 3.3. Generation of pH Gradient. 3.4. Change of Zeta Potential of Soil Particle Surfaces. 3.5. Change in Direction of Electroosmotic Flow. 3.6. Sorption and Desorption of Contaminants onto/from Soil Particle Surfaces. 3.7. Buffer Capacity of Soil. 3.10. Interactions of Geochemical Processes. PART II Remediation of Heavy Metals and Other Inorganic Pollutants. 4 Electrokinetic Removal of Heavy Metals (Lisbeth M. Ottosen, Henrik K. Hansen, and Pernille E. Jensen). 4.2. Principle of EK Removal of Heavy Metals from Soils. 4.3. Heavy Metal and Soil Type. 4.5. Remediation of Mine Tailings, Ashes, Sediments, and Sludge. 5 Electrokinetic Removal of Radionuclides (Vladimir A. Korolev). 5.2. Electrokinetic Localization of Radioactive Nuclide Pollution. 5.3. Electrokinetic Cleaning of Ground from Radioactive Nuclides. 6 Electrokinetic Removal of Nitrate and Fluoride (Kitae Baek and Jung-Seok Yang). 6.2. Pollution and Health Effects of Anionic Pollutants. 6.3. Removal of Anionic Pollutants by Electrokinetics. 7 Electrokinetic Treatment of Contaminated Marine Sediments (Giorgia De Gioannis, Aldo Muntoni, Alessandra Polettini, and Raffaella Pomi). 7.2. Contaminated Sediment Treatment Options. 7.3. Electrokinetic Treatment of Sediments. 7.4. Case Study: Tests on Electrokinetic Remediation of Sea Harbor Sediments. 8 Electrokinetic Stabilization of Chromium (VI)-Contaminated Soils (Laurence Hopkinson, Andrew Cundy, David Faulkner, Anne Hansen, and Ross Pollock). PART III Remediation of Organic Pollutants. 9 Electrokinetic Removal of PAHs (Ji-Won Yang and You-Jin Lee). 9.3. Electrokinetic Removal of PAHs Using Facilitating Agents. 10 Electrokinetic Removal of Chlorinated Organic Compounds (Xiaohua Lu and Songhu Yuan). 10.2. Electrokinetic Removal of Chlorinated Aliphatic Hydrocarbons. 10.3. Electrokinetic Removal of Chlorophenols. 10.4. Electrokinetic Removal of Chlorobenzenes. 11 Electrokinetic Transport of Chlorinated Organic Pesticides (Ahmet Karagunduz). 11.2. Electrokinetic Removal of Chlorinated Pesticides. 11.3. Surfactant-Enhanced Electrokinetic Remediation of Chlorinated Pesticides. 11.4. Cosolvent-Enhanced Electrokinetic Remediation of Chlorinated Pesticides. 12 Electrokinetic Removal of Herbicides from Soils (Alexandra B. Ribeiro and Eduardo P. Mateus). 13 Electrokinetic Removal of Energetic Compounds (David A. Kessler, Charles P. Marsh and Sean Morefield). 13.2. Chemistry of Clay–Energetic Compound Complexes. 13.4. Electrokinetics to Enhance Remediation Strategies. PART IV Remediation of Mixed Contaminants. 14 Electrokinetic Remediation of Mixed Metal Contaminants (Kyoung-Woong Kim, Keun-Young Lee and Soon-Oh Kim). 14.2. General Principle for Mixed Metal Contaminants. 14.3. Representative Studies on Electrokinetic Remediation of Mixed Heavy Metals. 14.4. Specific Insight for Removal of Mixed Heavy Metals, Including Cr, As, and Hg. 15 Electrokinetic Remediation of Mixed Metals and Organic Contaminants (Maria Elektorowicz). 15.1. Challenge in Remediation of Mixed Contaminated Soils. 15.2. Application of Electrokinetic Phenomena to the Removal of Organic and Inorganic Contaminants from Soils. 16 Electrokinetic Barriers for Preventing Groundwater Pollution (Rod Lynch). 16.2. History of Electrokinetic Barrier Development. 16.4. Use With Other Technologies. 17 Electrokinetic Biofences (Reinout Lageman and Wiebe Pool). 17.2. Application in the Field. PART VI Integrated (Coupled) Technologies. 18 Coupling Electrokinetics to the Bioremediation of Organic Contaminants: Principles and Fundamental Interactions (Lukas Y. Wick). 18.2. Principles and Fundamental Interactions of Electrobioremediation. 19 Coupled Electrokinetic–Bioremediation: Applied Aspects (Svenja T. Lohner, Andreas Tiehm, Simon A. Jackman, and Penny Carter). 19.2. Combination of Electrokinetics and Bioremediation. 19.3. Practical Considerations and Limitations for Coupled Bio-Electro. 20 Influence of Coupled Electrokinetic–Phytoremediation on Soil Remediation. M.C. Lobo Bedmar, A. Pérez-Sanz, M.J. Martínez-Iñigo, and A. Plaza Benito. 20.2. What is the Limit of the Remediation Soil Recovery. 20.3. Influence of the Electrokinetic Technology on Soil Properties. 20.5. Use of the Electrokinetic Process to Improve Phytoremediation. 20.6. Phytoremediation after Electrokinetic Process. 21 Electrokinetic–Chemical Oxidation/Reduction (Gordon C. C. Yang). 21.4. Electrokinetic Treatment Coupled with Injection of Nanomaterials. 22 Electrosynthesis of Oxidants and Their Electrokinetic Distribution (W. Wesner, Andrea Diamant, B. Schrammel, and M. Unterberger). 22.1. Oxidants for Soil Remediation. 23 Coupled Electrokinetic–Permeable Reactive Barriers (Chih-Huang Weng). 23.2. Design of Reactive Barrier in the EK–PRB Process. 23.3. Implementation of EK–PRB to Polluted Soil. 24 Coupled Electrokinetic–Thermal Desorption (Gregory J. Smith). 24.3. Physical and Chemical Principles. 24.4. Fluid and Energy Transport. 24.6. Biological Processes at Elevated Temperatures. 25 Electrokinetic Modeling of Heavy Metals (José Miguel Rodríguez-Maroto and Carlos Vereda-Alonso). 25.2. One-Dimensional EKR Simple Model. 26 Electrokinetic Barriers: Modeling and Validation (R. Sri Ranjan). 26.3. Direct and Coupled Flow and Transport of Ions. PART VIII Economic and Regulatory Considerations. 27 Cost Estimates for Electrokinetic Remediation (Christopher J. Athmer). 28 Regulatory Aspects of Implementing Electrokinetic Remediation (Randy A. Parker). 28.2. Overview of Environmental Regulation in the USA. 28.3. Regulatory Considerations for Implementing Electrokinetic Remediation. PART IX Field Applications and Performance Assessment. 29 Field Applications of Electrokinetic Remediation of Soils Contaminated with Heavy Metals (Anshy Oonnittan, Mika Sillanpaa, Claudio Cameselle, and Krishna R. Reddy). 29.2. Description of Processes Involved in Field Applications. 29.3. Electrokinetic Remediation Setup in Field Applications. 29.4. Outcome of Field-Scale Experiments. 29.5. Factors that Limit the Applicability of Electrokinetic Technology. 29.6. Prerequisites and Site Information Needed. 29.7. Advantages and Disadvantages of the Technology. 30 Field Studies: Organic-Contaminated Soil Remediation with Lasagna Technology (Christopher J. Athmer and Sa V. Ho). 30.4. Summary and Future Activities. 31 Coupled Electrokinetic PRB for Remediation of Metals in Groundwater (Ha Ik Chung and MyungHo Lee). 31.2. Electrokinetic (EK) Extraction System. 31.3. Permeable Reactive Barrier (PRB) System. 31.4. Combined System of Electrokinetics and Permeable Reactive Barrier. 32 Field Studies on Sediment Remediation (J. Kenneth Wittle, Sibel Pamukcu, Dave Bowman, Lawrence M. Zanko and Falk Doering). 32.2. Background on the Need for Remediation and the Duluth Project. 32.3. What is ECGO Technology? 32.4. The Remediation of Minnesota Slip Sediments at the Erie Pier CDF in Duluth, Minnesota. 33 Experiences With Field Applications of Electrokinetic Remediation (Reinout Lageman and Wiebe Pool). 33.3. Investigation and Design of ER.